I think I read this back when I was in my mid-20s but I really remember almost nothing. 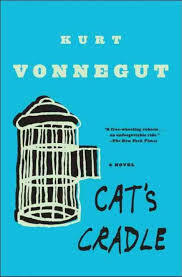 I’ve enjoyed others by Vonnegut – Galapagos especially – and I read a few science fictions every year – that’s what Vonnegut is considered. This book has short fast-moving chapters, quirky characters in comic futuristic (?) scenarios, science, religion, the atomic bomb, society, water, love, technology, American society, whatever was in Vonnegut’s head, I guess. Vonnegut’s biography is horrendous and fascinating and there are lots of clues as to where he’s coming from. Jonah (John) our first person narrator tells how the bomb was invented by one Felix Hoenikker when he was inspired by the eponymous string-and-fingers game. Jon wants to interview people as to what they were doing on the day the bomb was dropped. So he starts in with Hoenikker’s children, Newton, Franklin and Angela, and then becomes involved with a substance called ice-nine which is super deadly – it solidifies all water and acts as a seed on all contiguous water – so humans die on contact and the oceans would freeze – etc. Ice-nine makes the family rich and they go about getting their dreams, including a very high military rank for Franklin on the small, poor island of San Lorenzo – where he also becomes engaged to the dictator’s daughter, Mona. Newt and Angela set out to meet Franklin on the island and John happens to be on the same plane because he is scheduled to write the biography of Julian Castle, the former owner of the island. En route they meet an American (very! American) couple named Lowe and Hazel Crosby as well as the Horlicks, the newly appointed ambassador to San Lorenzo. Unfortunately, Angela dies from accidental freezing. The natives of San Lorenzo have a very peculiar society including their own now- illegal religious program, Bokononism, which is comprised of happy un-truths. The founder realized he could never make a utopia of San Lorenzo and did what he could with mystical “feel-good” sayings. The set-up of this religion is told in a long back-story. The island is currently under the dictatorial rule of “Papa” Monzano, a Christian, who outlaws Bokononism under penalty of death (but everyone including “Papa” continues to practice it anyway). But “Papa is about to die from cancer so he tries to bequeath the dictatorship to Franklin and then to Jon – with Monzano’s daughter thrown in as a prize. But “Papa” commits suicide using the ice-nine. Evil comes in the night and island life doesn’t turn out too well – I will not spoil it. This is a huge satire based on scientific advances and humanism – people aren’t bad but accidents and human nature are what they are. In Cat’s Cradle, most organized religion is seen as a tool of the powerful and an “opiate of the people.” Vonnegut addresses the issue of dictatorial rule vs freedom (coming from the Cold War era) and there’s even some gentle pokings at marriage itself. Oh! I read this too in my 20s and loved it … but can’t remember a lot about it. I was hoping you’d tell me more LOL!